Membranes are very thin sheets of a synthetic plastic material which have very fine holes or pores. 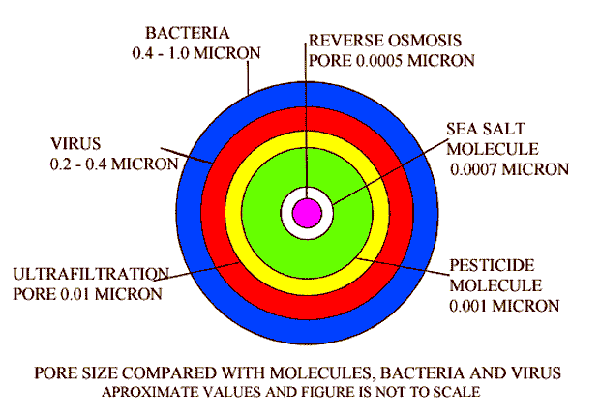 The size of pores are different in different types of water purification membranes. The types of membranes used to purify water are classified according to the pore size of membranes as Micro-filtration membranes MF, Ultra-filtration membranes UF, Nano-filtration membranes NF and Reverse Osmosis RO membranes. The types of membranes used in Reverse Osmosis RO water purifiers have the smallest pores and their pores are so small that it is just a little larger than the size of a water molecule and so it will allow pure water molecules to pass through easily, but will stop the passage of larger molecules of salts and organic chemicals. The figure below is a graphical representation of the pore sizes of different types of membranes used to purify water and how the pore sizes of types of membranes compares with the size of salt molecules, Viruses, etc. From the membrane pore size diagram above of types of membranes used to purify water, we can visualize and understand the relative pore size of RO Membranes and the sizes of common water impurities. This helps us to understand how an RO water purifier works. The pore size of RO membrane is 0.0005 microns which is smaller than the size of the Sodium Chloride Molecule which is 0.0007 micron and will not let it through. Nor will it let through germs and viruses, and organic molecules which are very much larger than the RO pore. Membranes are the best filtration media for water. Membranes used for water purification can have their pore size so designed to give the best efficiency for the job in hand. For example to purifyriver water it is not neccessary to have very small pores like an RO membrane which requires high pressure and thus need a lot of energy to work. So for water with low content of salts like river water you need to remove only the germs and dirt in the water, so the ideal membrane for such an application would be the UF membrane which use very little energy and will filter out the smallest of viruses and dirt particles. The river water that comes out of a UF membrane is clean and safe to drink. When there are salts in the water, like in seawater, then an RO membrane will be required to purify the water. So an RO membrane will purify water from almost all chemicals. What can pass through the RO membrane is water and molecules smaller than the water molecule, like CO2 gas. Smaller molecules than water is generally not harmful to health. The RO Water is very pure almost distilled water in quality. Bottled water manufacturers usually use Reverse Osmosis Water Filters to purify their water. 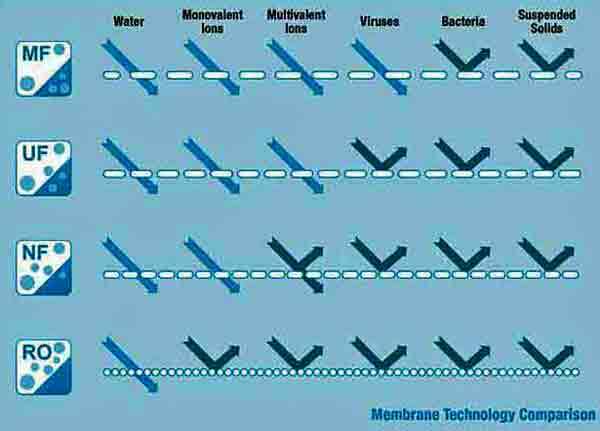 The diagram below is again a graphical representation of what can pass through the different types of membranes. Microfiltration Membrane has average pore size of 0.1 microns. Pore size can vary from 0.05 micron to 5 micron. Microfiltration good for removing water borne parasites like protozoa like, Cryptosporidium and Giardia, but is not good for removal of bacteria and viruses. Microfiltration is mostly used in the food industry for processing fruit juices and milk products.